ONI Bureau: A delegation led by Union Minister for Petroleum and Natural Gas, Dharmendra Pradhan met Union Home Minister Rajanath Singh on Thursday. 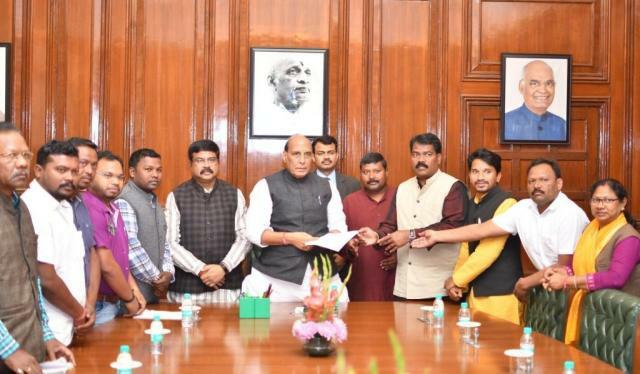 Local representatives of Odisha, Assam, Jharkhand and West Bengal today submitted a memorandum to the Home Minister, requesting him for inclusion of ‘Ho’ language in yhe 8th Schedule of the Constitution as an official language of India. Earlier, a large number of people from ‘Ho’ community from different states organized a ‘Mahasamabesh’ in Delhi in this regard. Worth mentioning, ‘Ho’ language, a very old tribal language is the mother tongue of more than a million tribal people living on the borders of Odisha, Assam, Jharkhand and West Bengal.